Many homeowners fall somewhere in between deciding whether air duct cleaning is useful or not. Although not statistically proven, there may be some benefit to it. Every household and situation is different so it is hard to simply make a generalization about the advantages and disadvantages. Here is some basic information to help you determine whether getting your HVAC ductwork cleaned results is useful for your household. Sometimes making this big decision all comes down to a simple inspection of your ventilation system. While inspecting, be on the lookout for dust, mold, odors, and all other kinds of deposits that can create contamination. If it turns out that you don’t have any of these issues, it is probably safe not to have your system cleaned. It is said that dirty air ducts carry dust and dust has something to do with allergies and other respiratory issues. 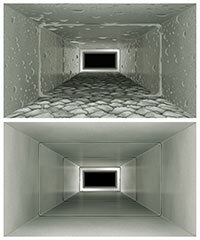 If no one is suffering from allergies, illness, or any other breathing related symptoms, getting your air duct system cleaned may be futile and a waste of money. It is normal for the vents to get dusty due to flowing dust particles that are drawn into the air system. This doesn’t necessarily constituted air duct contamination. You can easily resolve this minor issue by vacuuming the dust. Just as there are instances where ventilation cleaning can be avoided, there are also times where it is useful. If members of the household are constantly complaining of the quality of indoor air, clean the ducts. If these complaints are followed by continued allergies, sneezing, and other symptoms, you should clean also. If there is mold, debris, or infestation in your ducts, you should get them cleaned immediately. The quality of air in your home is very important; there is no price that can be placed on you and your family’s health.